This is the last (with the exception of The TV Movie.) Classic Doctor Who story. For that reason it has a high standing amongst the Doctor Who community but is it actually a good story? Let’s try and see it, not from a fan’s point of view, but from a first time viewer’s perspective. The first episode begins with a bloke wearing a weird get up and a young woman coming into a town. They walk through a hill on top of the town. They then walk into a club where people are doing defence classes. They wander around a bit. The chap who is called Doctor/Professor (The woman who is called Ace keeps calling him both at different times.) goes into a pet shop. There is a bit with two comedy shop owners. This really shows that Doctor Who is at a low point. Unlike the brilliant Battlefield, Curse of Fenric or Ghostlight, Survival has no proper jumping on point. 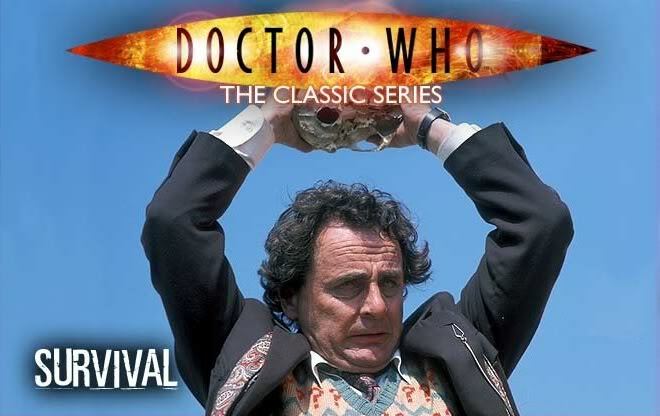 To watch and enjoy this story you have to know quite a bit about Doctor Who and The 7th Doctor’s era and have lots of patience. By Episode Two, the story delivers because The Master finally makes his presence felt. Unlike previous stories and seasons where The Master has been under used (i.e. Trial of a Timelord.) this story really uses the evil and power of The Master. The Doctor is put in a morally difficult situation which is most noticeable during the fight sequence in Episode Three. We are offered a portrayal of The Doctor as he is depicted like his enemy – The Master. McCoy and Aldred are excellent in this episode. McCoy is defiantly taking on the mentor aspect of The Doctor guiding Ace through the dark turn of events in Survival. Aldred is excellent as Ace. We see her troubled by the effects the planet of the Cheetah people have on her but also embracing the strange change that is over coming her. It could be argued that this story is a turning point for Ace as she comes to understand herself and her sexuality. The costumes of the Cheetah people are not the best. They are more domestic cat than fearsome, big cat mode. They are unrealistic and silly. Furthermore, the fur looks like it will fall off at any moment. It’s unfortunate that the costumes for New Earth and Gridlock were not born in mind when these costumes were designed. Survival is the last classic Doctor Who story. It is a sad and unfitting end to a show which had been running for 26 years. The trouble with Survival is it is too convoluted and just plain mad. Though thinking of this end, we must remember that’s not how Doctor Who ended. After the McGann hiccup (I’m still waiting for a proper Eighth Doctor series.) Doctor Who returned in 2005. The rest, as they say, is history.